In February, Olivia & Kieran hosted a online ako about supporting LGBTIQ to flourish and then in March Christina hosted a kōrero on working and living biculturally. 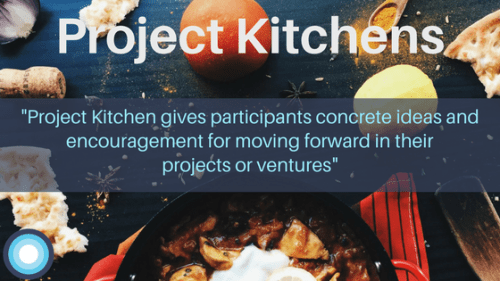 This month we changed tact and experimented with the project kitchen format–which we have used in person at our Fellowship and Oro programmes in the past. We must give a big mihi to Jade, who was our wonderful project holder (the ‘chef’ we like to call it). Jade put forward an idea that aims to establish Upper Hutt as a source of musical talent and a region that young people can be proud of. What environment would this take place in, e.g. in school or after school? Are there ways that you might incorporate this into NCEA credits via musicianship or stage management? Have you checked out the growing evidence base around music therapy? How might you keep yourself and others safe? What might recruitment for your first prototype look like? Amazingly, it turned out something similar has been growing up in Kaitaia. Jade was invited to link in with that group to explore what they had learnt to date running a similar kaupapa. Creating safe spaces for and with young people was a cornerstone of much of the conversation. One lasting tip was to think about how partnerships and organisational backing can support you with your legal obligations under the Vulnerable Children’s Act. If you’re a lone wolf running a youth wellbeing project, and somebody gets physically or mentally injured, you would need appropriate processes and safeguards in place. Partnering with an organisation that already has those safeguards (like insurance) can help you to test a new idea safely. We closed up the session with each person sharing their takeaways–which ranged from “This has been a safe, inclusive process” through to “this has been a good reminder that amidst all the excitement of a new idea there are some processes that we need to look at to keep ourselves and others safe”. If you are interested in Jade’s idea, you can get in touch with her via email. If you’re interested in hosting your own Project Kitchen (online or offline) you can get the instructions from our good friends at Enspiral. If you’re thinking of running it online we reckon the best platform to use is Zoom, however appear.in, Facebook Calling and Google Hangouts can be good alternatives.